Supermassive black holes don’t really form dust ‘donuts’ — the structures surrounding these bodies are more akin to galactic matter fountains, new research reveals. 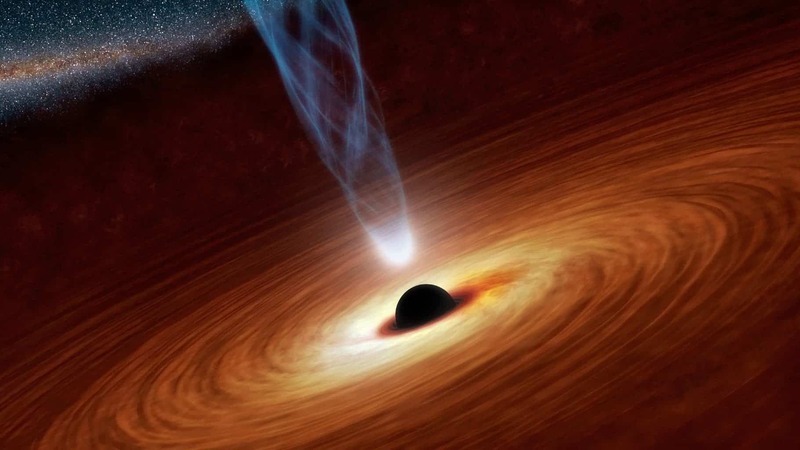 Artist’s concept of a supermassive black hole. Also shown are the accretion disk (donut) and the outflowing jet of energetic particles. Computer simulations and new observations from the Atacama Large Millimeter/submillimeter Array (ALMA) suggest that the gas accretion rings around supermassive black holes (SBH) aren’t ring-shaped at all. Instead, gas being expelled from the SBM interacts with infalling matter to create a complex circulation pattern — one which the authors liken to a fountain. Most galaxies revolve around a SBH. These objects can be millions, even billions of times as heavy as the Sun, and they knit together galaxies through sheer gravitational power. Some of these SBHs are actively consuming new material. So far, common wisdom held that instead of falling directly in, matter builds around an active black hole in a donut or ring-shaped structure. It wasn’t far from the truth but, new research reveals, it wasn’t spot-on either. A study led by Takuma Izumi, a researcher at the National Astronomical Observatory of Japan (NAOJ), reports that this ‘donut’ is not actually a rigid structure, rather a complex collection of highly dynamic gaseous components. The researchers used the ALMA telescope to observe the Circinus Galaxy and the SBH at its center — which is roughly 14 million light-years away from Earth. They then compared their observations to computer models of gas falling toward a black hole. These simulations were run using the Cray XC30 ATERUI supercomputer operated by NAOJ. All in all, the team found that there’s a surprising level of interplay between the gases in this structure. Cold molecular gas first falls towards the black hole to form a disk near the plane of rotation. Being so close to a black hole heats up the gas until its atoms break apart into protons and electrons. Not all of these products go on to be swallowed by the black hole. Some are instead expelled above and below the disk but are then snagged by the SBH’s immense gravitational presence, falling back onto the disk. Rough schematic of the process’ dynamics. Pc stands for parsec, equal to about 3.26 light-years (30 trillion km or 19 trillion miles). These three components circulate continuously, the team explains. Their interaction creates three-dimensional flows of highly turbulent matter around the black hole. “Previous theoretical models set a priori assumptions of rigid donuts,” explains co-author Keiichi Wada, a theoretician at Kagoshima University in Japan who lead the simulation study. 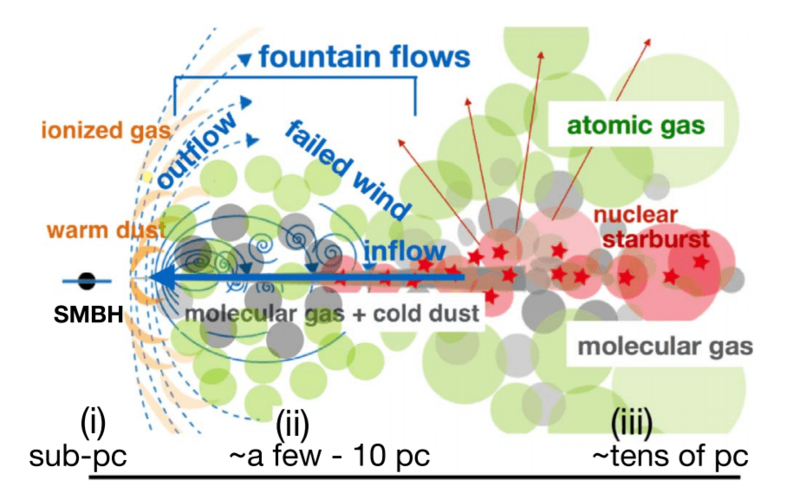 The paper ” Circumnuclear Multiphase Gas in the Circinus Galaxy. II. The Molecular and Atomic Obscuring Structures Revealed with ALMA” has been published in The Astrophysical Journal.